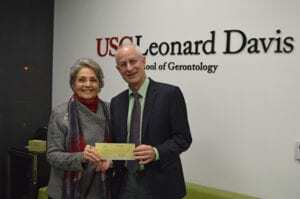 The Navigage Foundation has awarded $500,000 in grants for aging research at the USC Leonard Davis School. Faculty members Mara Mather, Kelvin Yen and Valter Longo will each receive $100,000 for research focused on heart rate variability and the effects on cognitive function, mitochondrial-derived peptides and their possible effects on healthspan, and the effects on healthspan of the longevity diet and nutrition, respectively. The grant’s remaining $200,000 will fund competitively selected projects at the school. Navigage is managed by DeWayne McMullin MAG ’02. Top (L-R): Associate Dean for Advancement David Eshaghpour; Deborah Weirick; Judy Vallas, Navigage Foundation Board Chair; Linda McMenamin; Dean Pinchas Cohen; and DeWayne McMullin, MA ’02 and Navigage Foundation Business Agent.